Want to Help End World Hunger? Go Vegan. 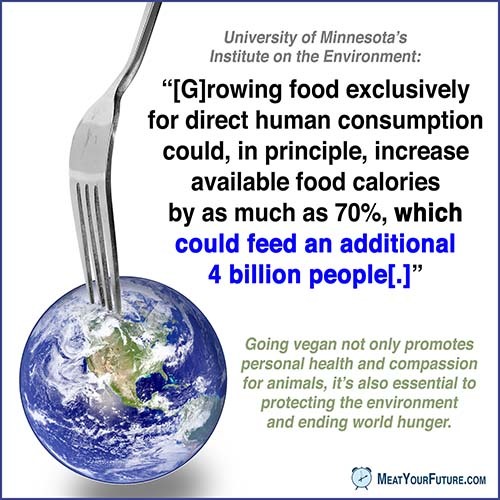 If we stopped eating animal foods and ate plant foods instead, we would have enough to feed an additional 4 billion people, according to a report from scientists with University of Minnesota’s Institute on the Environment. Currently, poor nutrition causes nearly half of the deaths (45%) in children under the age of five (or 3.1 million children every year). Our exploding human population growth rate, going from 1 billion to over 7 billion in just ~200 years, also places serious strain on our planet’s finite resources. And our population is continuing to grow, projected to hit a staggering 9 billion by just 2050. Apart from a much needed curving of our population growth rate, our food choices are central to this humanitarian issue. If we want to adequately address world hunger, then we also need to move away from animal agriculture and towards vegan food systems. Please go vegan to help fellow human beings, the environment, your personal health, and to avoid the needless killing and suffering of countless billions of animals. Is Animal Abuse a Tradition Worth Continuing?